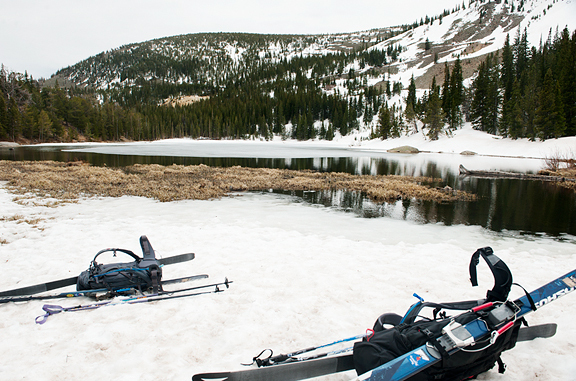 It’s important for us to keep one finger on the pulse of our local backcountry. We are always desiring to know the state of the snow, be it the avalanche conditions or the overall quality of the snow. Is the approach clear of snow, patchy snow, full snow, ice, slush, snirt, corn snow, powder. Part of the reason is to know what gear to bring and the other part is to gauge when we should transition from skiing to hiking. It has been so warm that we figured the snowpack had another couple of weeks before turning into a junk show. 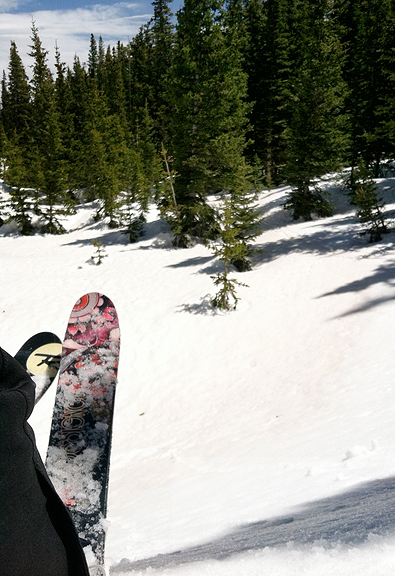 We have been trying to get some turns before putting the skis away for the season. 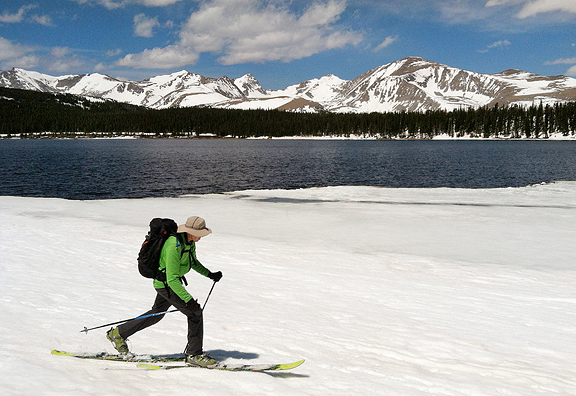 Of course, we’re not the only ones interested in the backcountry conditions. 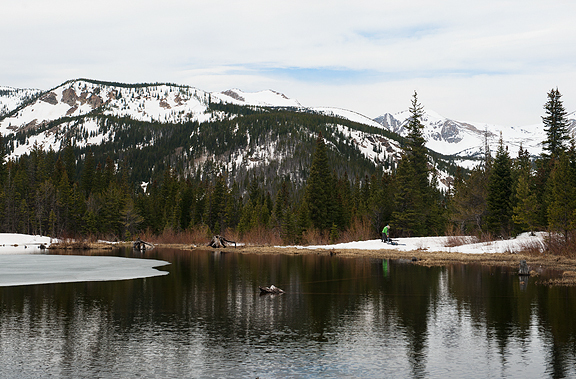 My friend, Erin Block, is a highly-regarded angler whose ears and eyes perk up whenever I post photos and issue an alpine lake report from our ski noodlings in the mountains. See, it’s not just ski whores who love on the mountains. If anyone was hoping for an early melt, it looks like Nature has other plans. Stormy volatile weather is moving in and we’ve been experiencing lots of thundersnow, graupel, and hail at our house. They are forecasting a foot of snow for Mother’s Day! Despite our return to cold weather, my food cravings have barreled ahead into the heart of spring. I noticed king salmon is showing up at the seafood counters as it is the season. 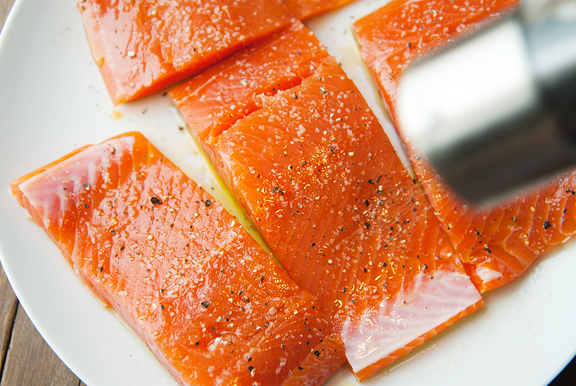 King salmon is amazing stuff, but it’s also outrageously expensive here in landlocked Colorado. I opted for the wild coho salmon that was previously frozen and on sale. It suited my purposes perfectly. When I dine out at a restaurant I’m familiar with, there is always the dilemma of ordering what you know is good or ordering something new. Whenever I want to play it safe at The Kitchen in Boulder for lunch, I always go with their salmon and cucumber salad. It is a favorite of mine that is satisfying without weighing me down and lulling me into a nap. And you know what? It’s easy enough to make at home. My version isn’t exactly like the restaurant version, but it’s awesome nonetheless. 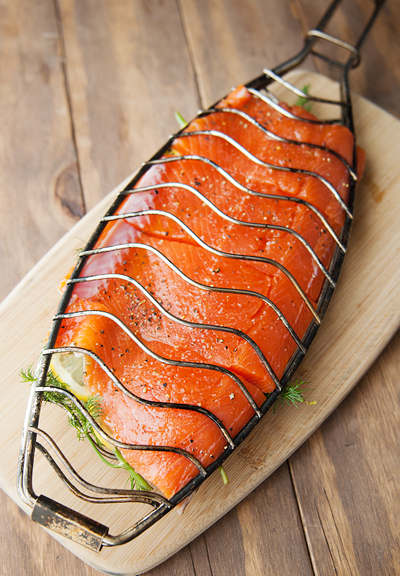 If you don’t have a fish basket or grill basket, you can cook the salmon directly on the grill, just omit the dill and lemon. Or if you can’t grill the fish, bake it, poach it, steam it, or pan fry it. It’s all good, but I prefer the ease of grilling. Now the cucumbers I buy are Persian cucumbers or sometimes cocktail cucumbers (smaller). Both are crisp and not as watery as slicing cucumbers or even English cucumbers. If you use the latter two varieties, you might want to slice them in half lengthwise and scoop out the seeds and pulp before slicing them up. I don’t bother doing that with the smaller varieties. 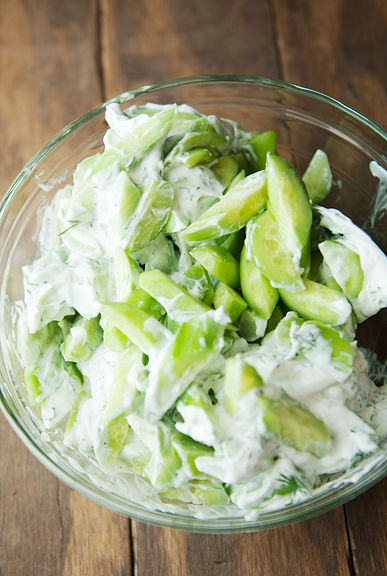 The cucumber salad is practically like a chunky tzatziki without the garlic. 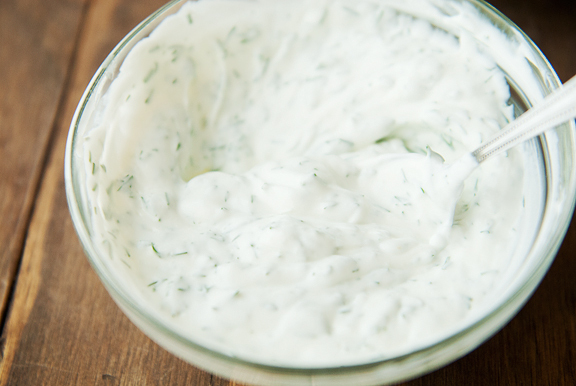 You can use plain yogurt or plain Greek yogurt. I went with the Greek yogurt because I didn’t want the cucumber salad to be runny and I used the full fat Greek yogurt because nonfat yogurt leaves a film in my mouth. The greens are dressed simply with lemon, olive oil, and salt and pepper. 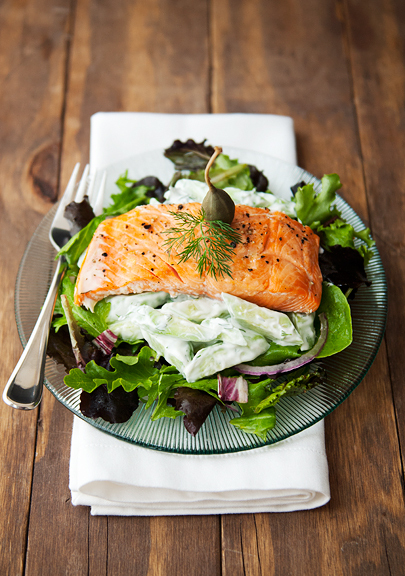 Once the three components are ready, it’s as simple as layering the greens, the cucumber salad, and the salmon. And while I plated the dish on a salad plate, I really recommend a larger plate or wide shallow bowl because the salad is best with a generous bed of salad greens. We sat down to watch American Hustle while we had this for dinner. Jeremy loved it so much he wouldn’t stop gushing over it during the movie such that I had to tell him to shut it. Even little Kaweah, who typically hides in the other room when we watch a movie, hung around by my plate giving me the look that says, “Oh hai! I eat salmon. I just thought you should know.” But really, it is THAT good. 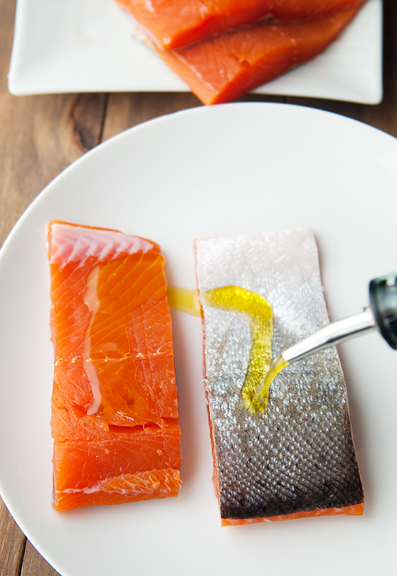 Grill the salmon: Rub a little olive oil on both sides of the salmon pieces and season both sides with salt and pepper. 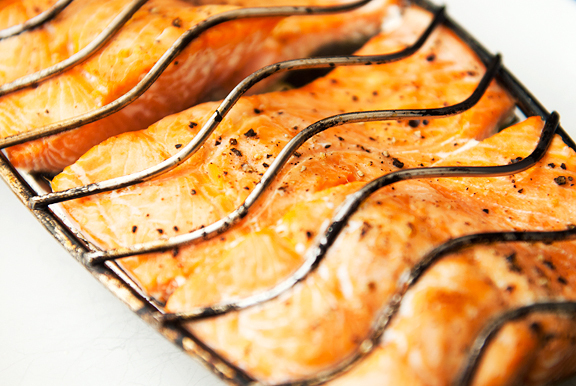 Rub some vegetable oil on the grates of your fish basket (the inside – the parts that will touch the food). Layer the dill sprigs on the bottom of the fish basket. Layer the lemon slices evenly over the dill. Set the salmon pieces skin-side down on the lemon slices. Close the fish basket securely over the fish. Clean the grates on the grill and turn the burners to high (or prep the coals to high heat). Grill the salmon, skin-side up for 2-3 minutes with the lid closed. Flip the basket and grill the salmon for another 4 minutes or until it looks mostly done. Remove from heat and carefully release from the fish basket. 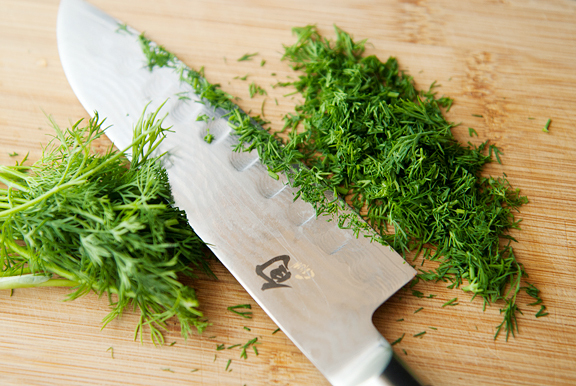 Remove and discard the skin and charred dill and lemon slices. 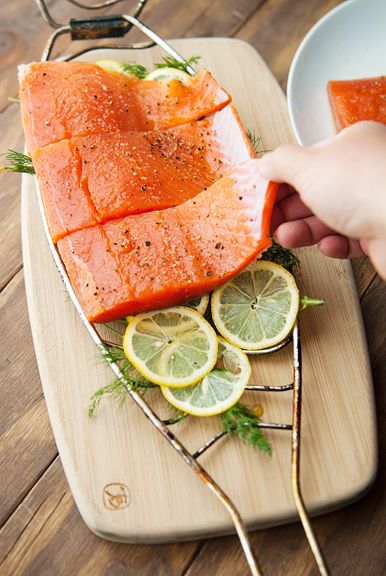 *If you don’t have a fish basket, you can omit the dill and lemon and grill directly on the grates – just be sure to oil the grates using tongs and a paper towel soaked with a little vegetable oil. Grill skin-side up and only flip the fish when it releases easily from the grates. Finish grilling skin-side down. Make the cucumber dill salad: Persian and cocktail cucumbers tend to be crisp and less watery than English or slicing cucumbers. 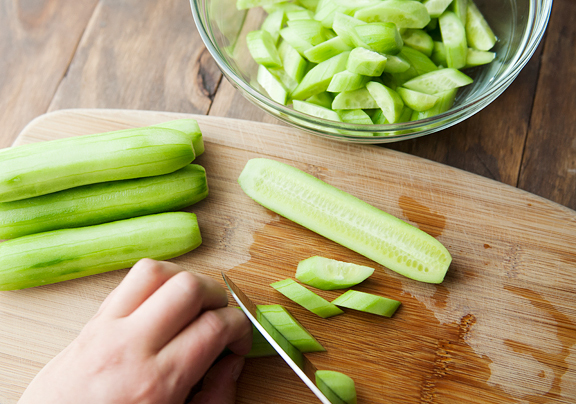 If using larger cucumbers with lots of pulp and seed, slice the peeled cucumbers in half and scrape the seeds and pulp out with a spoon before slicing. 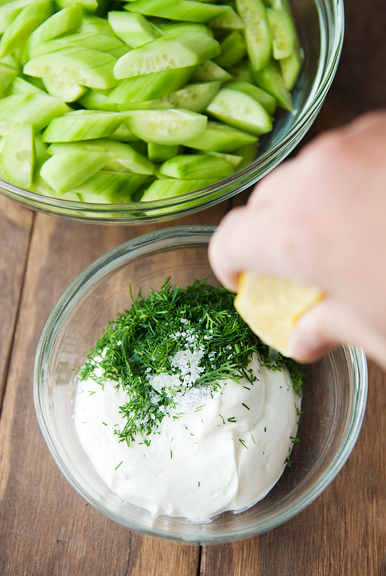 Combine the cucumbers, yogurt, dill, kosher salt, and 1 tablespoon of lemon juice together in a large bowl. Add more lemon juice to desired taste. Prepare the greens: In another large bowl, toss the greens, red onions, olive oil, sea salt, black pepper, and 2 tablespoons of the lemon juice together until the green are well coated. Add more lemon juice, salt, and pepper to taste. 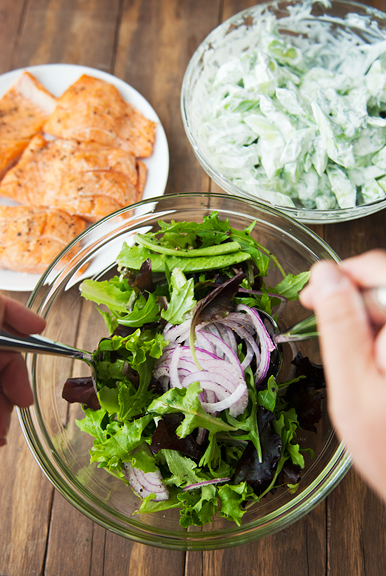 Plate the salad: Place 1/4 of the greens in a large shallow bowl or a large plate. Arrange 1/4 of the cucumber salad over the greens. 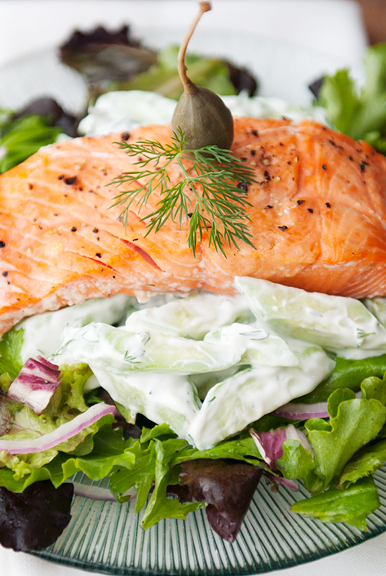 Set a piece of salmon on the cucumber salad. Garnish with dill or capers. Serves 4. Ok, is that a giant caper as a garnish? I’m glad it’s there, because I was drooling over this and wondering what I could use in the salad instead of dill, and I think capers would be yummy! Thanks for the reminder that we haven’t seen American Hustle yet! 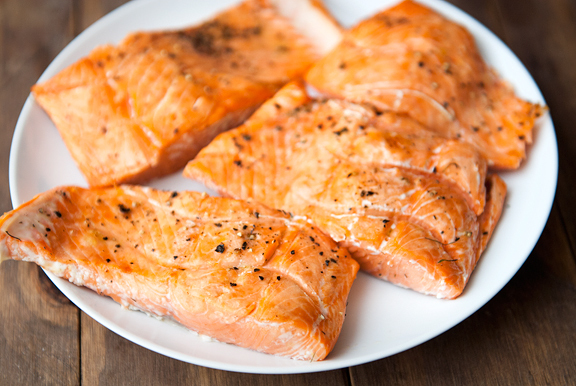 Mmm… Salmon… I live in the Columbia River Gorge and there’s been an influx of spring salmon (aka Chinook/King) lately. My family was able to get our hands on a 15 pounder and it’s absolutely delicious fresh. I am in love with your fish basket! Yes. 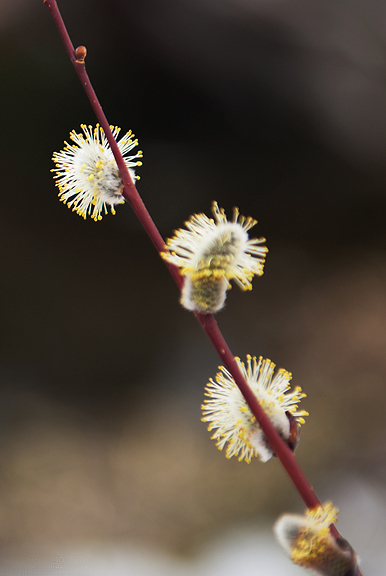 This SHOUTS Spring! And I love anything with those big, damn, caperberries! Hope our sweet Kaweah got a little salmon love. I am thinking of her (and you). As for this salad–awesome! I love the version at The Kitchen–can’t wait to try this! Grilled fish is the best! I was just thinking of doing this for my next camping trip. Thanks for the recipe! wow!! looks delicious..that’s a cute fish basket, too- didn’t know those things existed! 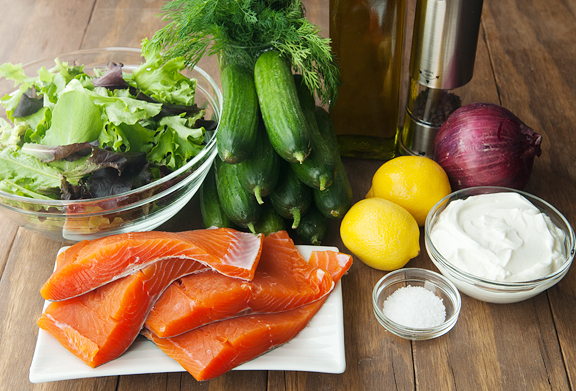 i love salmon and i love crunchy cucumbers and dill..
ps- I love when I get to look up a word in your blog. 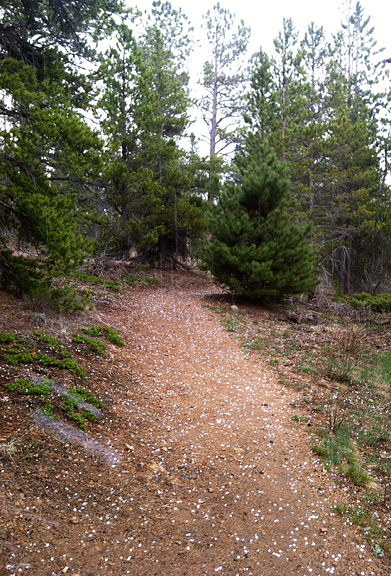 Graupel was a new one for me. I’m going to remember this for Words With Friends! Kristin – yes! They’re a little seedy, but I love them :) And American Hustle is GREAT. KalynsKitchen – that was a gift from my dad years and years ago. It’s from Williams-Sonoma, but I really love it because it means I don’t have to grease my fish as much or tear it up on the grates when grilling. Quyen – wow, I should camp with you! We eat super simple stuff when we backpack. megan – yep, the basket exists and it’s awesome. We use it all the time on fish!